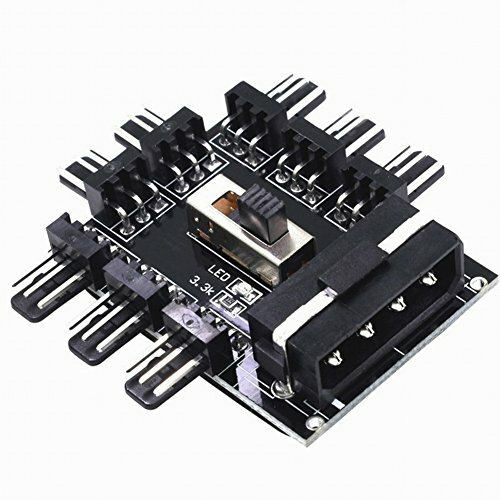 Designed for 3Pin fan; Power interface IDE or SATA supplier power (two options); Support simultaneous starting of 8 channel 3PIN fans, Solving the problem of shortage of motherboard. EVA double-sided adhesive can be used to fix the hub in the chassis. Without functions of speed detection and PWM, you can manually shift the gears, start the fan at full speed or low speed, or turn off the fan. Installation: With 3M glue on the back, you can fix the hub in the chassis. Application: Widely used for PC computer water cooling system. Installation: With 3M glue on the back, you can fix the hub in the chassis. Application: Widely used for PC computer water cooling system. Note: When at low gear, the fan with led lamp, the brightness of LED lamp will reduce or the lamp will not work. a small part of it does not support low voltage starting and it will not operate at low gear. If you have any questions about this product by Wathai, contact us by completing and submitting the form below. If you are looking for a specif part number, please include it with your message.